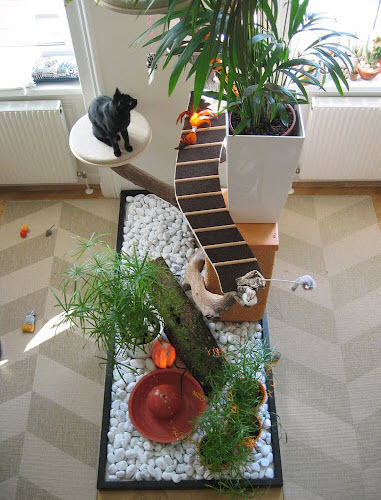 Make an island-like play area for your cat! Cut a piece of plywood to the desired size for the island. Attach wood runners around the top edges of the platform, paint the platform, then coat it with sealant. Fill the tray with rocks or other substrate. Put a small table on the island, and attach platforms or ramps on the table for your cat. Set other items on the platform that your cat would enjoy, such as potted plants, a fountain, or a log to lay on.